You may remember Ōtaki’s i-SITE. It was housed in the heritage-registered courthouse (1891) located in Centennial Park, Main Road. Sadly, it closed in June, the site “no longer economic,” but new life has been given to the former information centre. 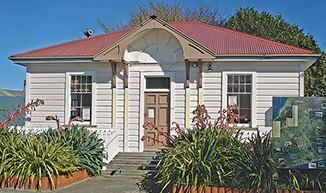 The Council’s Environment and Community Development Committee recently approved a recommendation from the Ōtaki Community Board that the historic building be leased to the Artscape Art and Craft Cooperative. Community Board Deputy Chair Rob Kofoed believes the art cooperative is a good fit for the site. The Artscape Art and Craft Cooperative is a combination of local artists and craftspeople, including Catherine Douglas, Karen McKeown, quilter, Robynne Fellows, Kirsty Green who works with textiles and other media, potters Rod Graham and Kevin Haste, artists George Thompson and Sherryle Robson, and Lynda Richardson who creates artwork using mosiacs. Currently working at Hyde Park Village, Te Horo, the Cooperative display and sell their art, generating income out of sales. Rob Kofoed says the group will make good use of the old courthouse space, and will also share their various skills and knowledge. The courthouse is a valued community asset and the heritage building will “provide an exciting and efficient way to deliver visitor information,” a service and attraction that will benefit Ōtaki.